Amen Brother. Maybe the Flat Earth Warmers will review the movie,”Dumb and Dumber” now. Jokes Anyoneis even older . You mean like how you got caught using two identities, and had to start all over? Treating the atmosphere like an open sewer has no consequences? Do a search and you will find articles of fossils found recently in Antarctica that show it was a forest during the age of dinosaurs. This shows to me once again that we don't have a clue about climate change and all the money in the world can't buy off mother nature. Mark, I'm not sure if you're being sarcastic with your post. Was that a tongue-in-check comment about Antarctica? Thanks Mark. 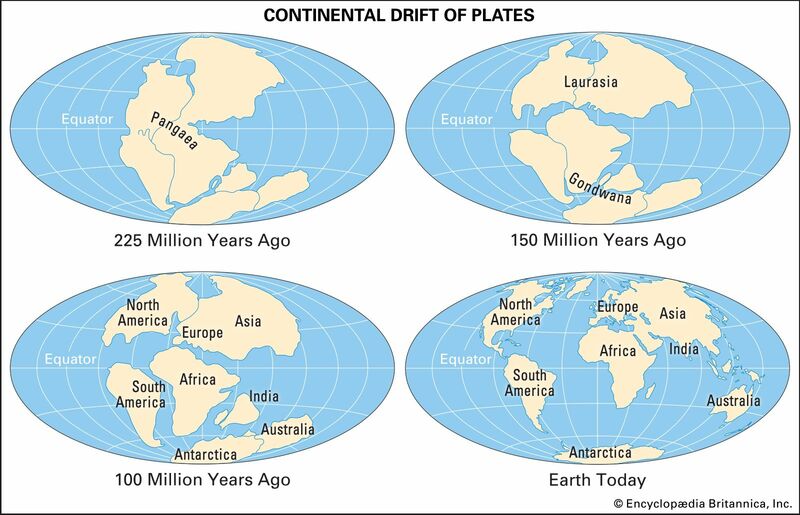 It seems odd that in three separate articles, there was very little to no mention of plate tectonics, and movement of this continent northward (significantly) in the time era they noted, and hence the seemingly warm climate that would allow the growth diversity not seen today now that the continent has shifted to the southern-most region of the planet. That information was probably out of scope for the articles, but none-the-less, another example where a plethora of information or data makes up current science's claim of anthropomorphic factors causing or greatly contributing to a significant increase in the rate of temperature and climate change. Interesting. Below is a screenshot of an animation of the movement. In this shot, Antarctica is the dark brown glob in the middle, centered around 45º south longitude (between 30º and 60º , with the south pole barely visible well below it), where it stopped the north migration, and then started south again. "However, climate change alarmists always find somewhere on Earth where temperatures are higher than ever. The focus is always on isolated temperatures that have reached all-time highs while the same reports ignore all-time record lows. These zealots would like you to believe that due to fossil fuel emissions, summers are now longer and hotter while winters are shorter and milder. " "The highest temperature ever reported was 136 degrees Fahrenheit in Libya in 1922. The record high temperature for the United States was 134 degrees Fahrenheit in Death Valley, California, in 1913. Fossil fuel emissions in 1913 and 1922 were negligible compared to today." Which jives with what many of us have been insisting is the case for years now. Back in 1996, we had a Nor'Easter HERE that blew for about 2 weeks...had 3' of snow on the ground...a nearby lake froze over...roofs caved in. THAT combo hadn't been seen in this area since the 1950s (the winter of 1956 or '57, I think)...and yet, here it was again. GW/CC-types will say that was just an ANOMALY that doesn't disprove the GW/CC theory...whereas if the weather during that SAME period had "spring"-like - they'd have insisted it confirmed GW/CC >IS< going on (just as is pointed out in the above article.). OTOH, I personally shoveled about 8" of global warming off my driveway about 3-4 days ago. The EPA did a job decades ago. Is there a way to ignore a thread?